My last post in the Redefining Procurement Series finished by stating that the key to being a great leader is understanding your stakeholders needs and drivers and adapting your approach and metrics to their unique needs. With this established, we now need to understand how procurement can (and should) engage with the various departmental stakeholders and forge close working relations. 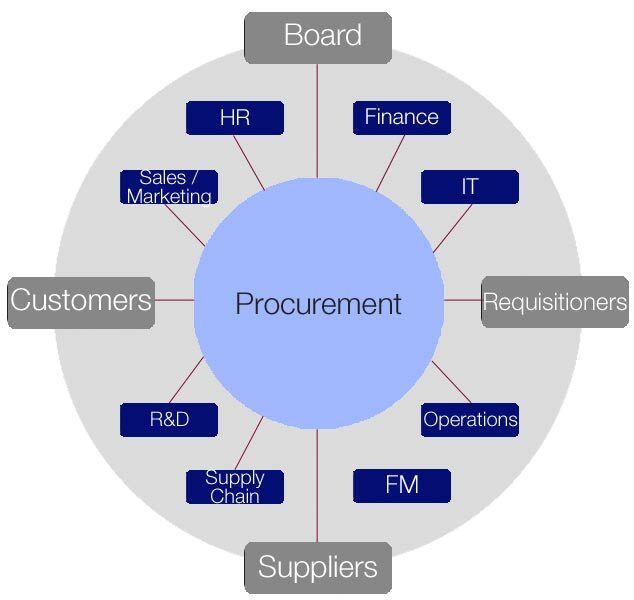 The above figure shows the interconnectedness of procurement within an organisation, highlighting internal and external touch points. Each of these touch points has a different definition of success (e.g. benchmarks, and dashboards), a different set of operating characteristics (e.g. dynamic and flexible vs process driven) and most importantly different people with different experience, expertise and expectations. Forging close ties with any department requires procurement to understand these various facets of their internal customers and rather than dictate terms or processes, procurement should instead take on an advisory role within the organisation - sharing knowledge, insight and expertise with the rest of the business to improve performance, processes, operations and therefore how to procure not just better but smarter. Andrew Collopy, Global Procurement Director, Downstream at British Petroleum (BP) during a recent interview* attributes a big part of the success he and his team has seen in terms of engaging back with the business as a result of "beginning to speak the language of the business and more specifically speaking finance's language." However, Andrew advises it's hard work maintaining such a high level of internal management and as such a challenge that has arisen is "how much time to spend on this internal validation piece - not distracting our good procurement people away from their time in the supply base."
What are some of your key challenges inhibiting better internal communication within your organisation?